antennaPRO are very active on social media and have accounts across the following networks dedicated to providing extra content and news for customers and followers. 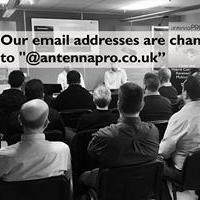 From the start of April, you might notice email correspondence from us will end in "@antennapro.co.uk” and no longer "@procomuk.co.uk”. Don’t be alarmed; we have changed our email address to reflect the identity we have held for the past four years and to avoid any possible confusion. With the increasing need to optimise usage of every antenna mast, more and more signals are being combined at the base station radio site. Fitting this large amount of combining/radio equipment into the available racking is a constant challenge for the radio installer/integrator. A modern, safe airport is faced with many challenges to offer a wide range of wireless communication needs. Airside, Air traffic control (ATC) must be securely handled as well as live up to international standards. Also, communication for caterers, mechanics and luggage handling as well as perimeter security is a necessity for smooth and safe airport operation. Amphenol Procom has just launched a new standard clamp for all 50-76mm diameter base antennas. What is the Internet of Things? What can antennaPRO supply my organisation? 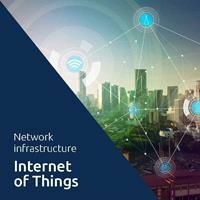 The Internet of Things (IoT) is generally used to describe objects “Things” used to connect physical objects over a wireless or IP network to exchange, store and collect data. The data is collected by sensors (endpoint devices). One of the benefits of the IoT is that businesses have access to more data about their products and their internal systems, and a greater ability to make changes as a result. 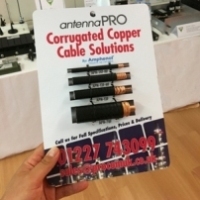 antennaPRO, UK distributor for Amphenol Procom will be showcasing its latest range of connectivity products at BAPCO 2019 between the 12th – 13th March at the Ricoh Arena in Coventry. On show will be samples of its extensive range of the antenna, duplexer, combiner and filtering solutions from the Amphenol Group. We recently had some great feedback from Ryde Inshore Rescue regarding the quality of our PRO MA21SC marine VHF antennas which they have installed on their latest boat, a 8 metre RIBCRAFT. What is Passive Intermodulation (PIM)? 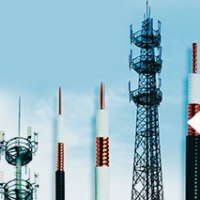 PIM stands for Passive Intermodulation which means an unwanted signal created by the mixing of two or more RF signals, caused by the nonlinearity of the passive components in the RF path such as antennas, filters, cables or connectors. The signals will mix or multiply with each other to generate other signals that are related to the first ones. PIM can occur in a variety of areas from coaxial connectors to cables, even rusty bolts or any joint where dissimilar metals occur. As the official distributor for Amphenol Procom products in the UK and Southern Ireland we can source a vast range of filtering equipment including duplex filters, band pass filters, band reject filters, pass reject filters, low pass filters, diplexers and triplexers. My Training Session at Amphenol Procom, Leaders in Radio Connectivity technology. We are delighted to add a new range of mobile phone repeaters to our portfolio. Cel Fi “GO X” and “Quatra” products are designed to improve internal coverage and to support new POC/LTE radio systems where poor signal strength indoors inhibits the system. Over the holiday period, antennaPRO will close at 12:30 pm on Friday the 21st of December will reopen at 8.30 am on Wednesday the 2nd of January. Amphenol Procom has announced the launch of their new website. In advanced communication networks, the reliance on the network to do what it was planned for is paramount. Public Safety networks, at a time when it is most critical, should just simply work. TETRA networks have deployed Amphenol Procom base station antennas since the very first network was installed way back in the mid-1990’s. 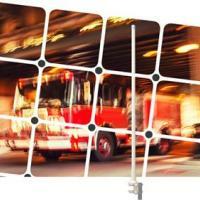 Today LTE networks face the same challenges, not just for Public Safety, but for all LTE communication networks. antennaPRO will be showcasing its latest range of connectivity products at FCS Business Radio 18, taking place at the Chateau Impney, Droitwich Spa on Thursday 15th November 2018. On show will be samples of its extensive range of antenna, duplexer, combiner and filtering solutions from Amphenol Procom. 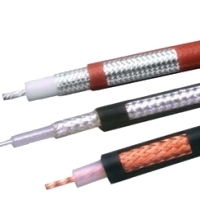 Corrugated Copper Cables Cut to Your Customers Requirements. Adding another service to our extensive range of connectivity products is our cabling service. 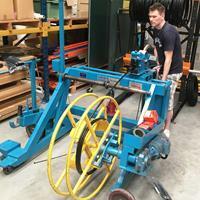 We have invested in a cable cutting machine so that we can cut commercial corrugated copper cables to order. We also have the facility to customise cables further by adding connectors/plugs as per your customer requirements. 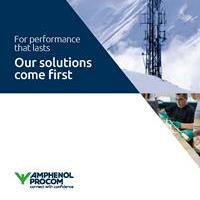 Download the Latest Amphenol Procom Catalogues! We have a new section on our website giving you the opportunity to download the full range of Amphenol Procom catalogues. Each catalogue provides details of the latest ATEX, DAS, IOT and TETRA Combiner ranges. 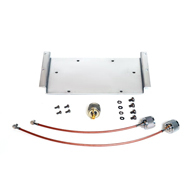 We are pleased to announce details of a new mounting kit for the Motorola SLR 1000 Repeater, enabling you to mount the Amphenol Procom MPX 2/6 or MPX 70/6 duplexers in an SLR 1000 repeater. We are pleased to announce that from May 15th, 2018 Amphenol Private Networks and their strong portfolio of brands (Procom, Jaybeam and Skymasts ) have been streamlined into one single brand and company, Amphenol Procom. In accordance with the General Data Protection Regulation (GDPR) (25th May 2018), we have been updating our customer records. The new GDPR regulations place an obligation on us to respect any personal data that we hold. Operating solely in the B2B environment, we hold contractual information of our customers. We believe there is a lawful basis for using this information based on our trading relationships. 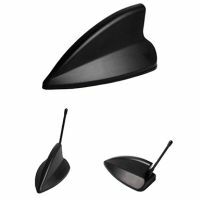 ProFin G1 & ProFin G2 Multi-Function Low Profile Vehicle Antenna, New! The current need for a wide variety of radio communications in vehicles demands multiple antennas that require time-consuming installation and possibly performance issues. 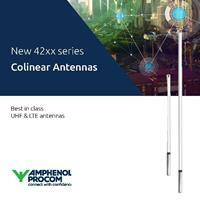 With this in mind, we are pleased to announce the release of the ProFin Multi-Function Low Profile Antenna range from Amphenol Private Networks (APN). Maintaining its position as the leading designer and manufacturer of DAS products and devices, Amphenol Private Networks (APN) have launched its most comprehensive collection of DAS products all in one place…the 2018 DAS Catalogue. We now have three power splitter products with either 2, 3 or 4-way splits. Each model has N-type option, 7/16 DIN and the new 4.3-10 connector. 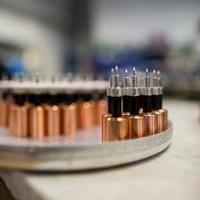 All models are designed and manufactured to focus on delivering impressive performance. We are pleased to add three new wideband 698-4000 MHz antennas to our impressive product range of Distributed Antenna Systems (DAS) products. In the growing market where technologies and frequencies collide, ceiling space is cluttered and overall aesthetics of buildings are impacted by the antenna farm on the ceiling. So we are pleased to announce new wideband 380-2700 or 380-6000 MHz low profile antennas for combining public safety and cellular networks…all in one antenna! Directional Couplers (380-2700 or 698-2700 MHz), New! 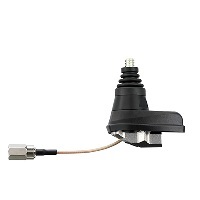 We are pleased to announce a new line of Directional Couplers to our growing Distributed Antenna Systems (DAS) product line. 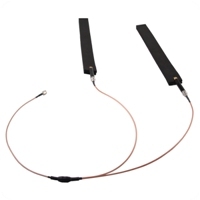 Adding to the previously announced Power Splitters for 380-2700 and 698-2700 MHz, this launch of passive devices complements our extensive range of over sixty available antenna models. 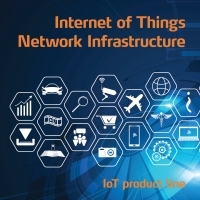 Have you heard about the Amphenol Private Networks IoT product range? Download the brochure now! Amphenol Private Networks has a strong IoT portfolio of base station antennas, external end-device antennas and filters. TETRA radio networks are deployed and used in a wide range of different sectors including public safety, transportation, utilities, government, military, oil and gas industries. Even the best network designs and rollouts will leave areas that have gaps in coverage. There may also be instances where there is insufficient or no coverage specifically inside buildings and tunnels. The result is poor or no coverage that compromises operational effectiveness and risking a potential safety of life. If you are in the trade and need professional cabling, we still have units left of this great Point of Sale (POS) which attractively showcases some of the various cabling products we sell. antennaPRO will be showcasing its range of connectivity products at BAPCO 2018 between the 20th - 21st March at the Ricoh Arena in Coventry. On show will be samples of its extensive range of antenna, duplexer, combiner and filtering solutions from the Amphenol Group. Our team regularly attend technical and sales seminars at PROCOM HQ in Denmark. A considerable amount of technical information is usually conveyed in what can be quite a tight schedule. 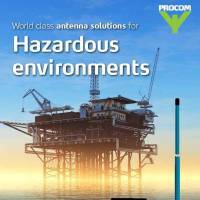 Procom offers more than 25 different ATEX antenna types, and you can now view them all in the latest PROCOM ATEX antenna brochure. 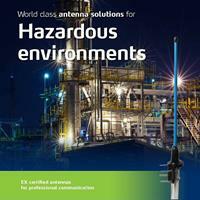 All the antennas are designed, tested and approved in compliance with European 94/9EC ATEX directive. We have recently held a series of technical workshops across the country. The first of these was held at the Amphenol Private Networks Group headquarters in Wellingborough, Northamptonshire on the 12th October 2017. Led by our Business Development Manager Trevor Wright, the event saw our customers given a tour of the factory as well as training sessions focussing on antennas. 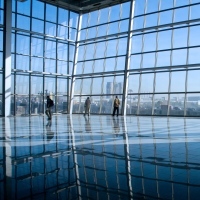 One of the most significant potential growth areas for communication companies will be provided by the opportunities from large building and infrastructure that require connectivity, but their topography and architecture prevent this. 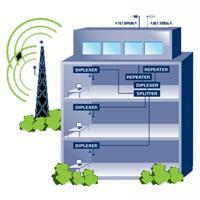 However, this issue that can be solved with the help of DAS (Distributed Antenna Systems). To coincide with the launch of the sale of our new range of cable products for professional communication systems, we are delighted to offer this great Point of Sale (POS) which attractively showcases some of the various cabling products …it also shows their great quality. 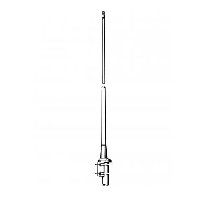 Amphenol 7500 single band end-fed dipole series is a rugged and durable VHF end-fed dipole antenna housed inside a high-strength glass fibre shroud. 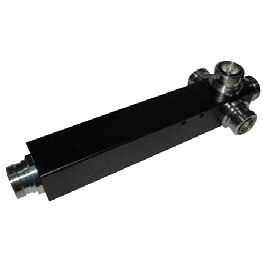 An integrated mounting clamp allows easy installation on poles or horizontal rails. 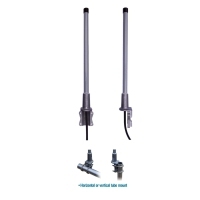 The rugged and durable Amphenol 7536 UHF collinear antenna series has been designed for use in TETRA networks. 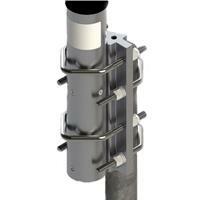 The design is housed inside a high strength, glass fibre shroud and includes an integrated mounting clamp allowing easy installation on poles or horizontal rails. 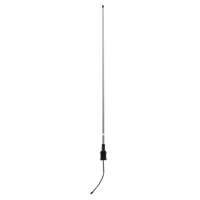 The Amphenol 7051 is a UHF centre fed dipole antenna for PMR/Trunked Radio networks. Multiple dipoles can be mounted on a tower and connected with a phasing harness to form a high gain, stacked array. Produced to the highest quality standards, the robust antenna design will ensure reliable operation in harsh environmental conditions. 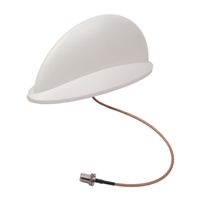 The 802.00.05.00 is a compact, stylish and efficient indoor antenna designed for use with UHF TETRA & PMR systems. Its ingenious radiator design allows for incredibly broadband operation making the antenna suitable for use within either UHF TETRA frequency band. Its stylish design makes for a discreet installation in any modern office or industrial complex, and the antenna is simple to install with the minimum of fuss. antennaPRO will be showcasing its range of connectivity products at FCS Business Radio 17, taking place at the Chateau Impney, Droitwich Spa on Thursday 16th November 2017. The S.EFX series of glass fibre dipoles are designed for professional base station and fixed mobile applications. 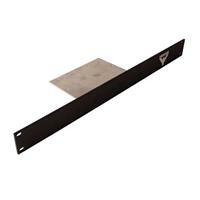 The antennas have been designed with an integral dual-purpose mounting bracket which has been cast in aluminium. The stainless steel fittings enable the antennas to be fixed to the top or side of a vertical pole up to 60mm diameter. 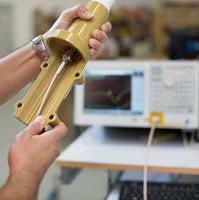 The centre fed dipole is fed via coaxial cable, giving a stable radiation pattern over a wide operating band. 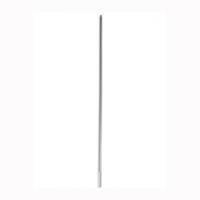 The S.C3B series of glass fibre collinear antenna is designed for professional base station and telemetry applications. The ability to deal with extreme conditions, have high safety requirements and provide great value is expected for any communication system. 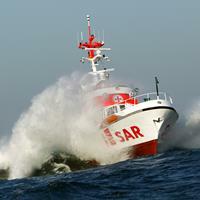 The Swedish company, CNS supplies Automatic Identification Systems (AIS) that are both robust and can live up to their global customer's high demands. 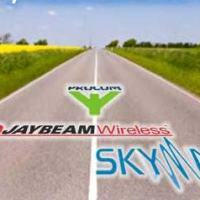 Since the recent mergers within the Amphenol Group there has been a lot of work going on in the background and consolidation between the Procom, Skymasts and Jaybeam product ranges. 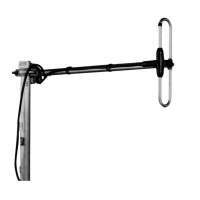 So we are going to focus on highlighting some of the more popular products regularly on our website starting with the Amphenol Jaybeam 7018 12-element UHF Yagi antenna Series. 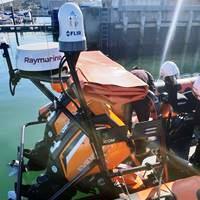 Thales use Procom CXL-Line TETRA base station antennas on its tactical mobile communication system, DIGITRAC. 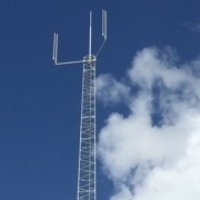 The 7586200 Jaybeam antenna is being used for the C2000 public safety network in the Netherlands. 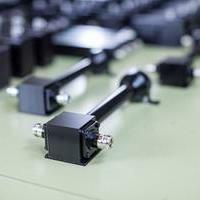 The 7586200 antenna from Jaybeam was chosen as the main antenna for upgrading the C2000 Network in the Netherlands and was integrated late 2016/early 2017. DeLaval is a leading supplier of solutions that improve the performance of farms for professional food producers. DeLaval activity meter system is designed to give the highest hit rate for finding cows in heat, together with excellent cow comfort and 24-hour surveillance. For its antenna provision, DeLaval chooses Procom's antennas across the globe. 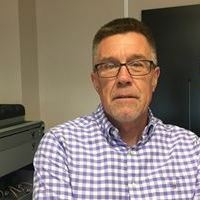 antennaPRO is delighted to welcome Trevor Wright to their team as Business Development Manager. 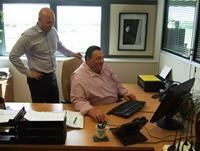 Trevor’s new role will be supporting and developing existing customers businesses. He will also be responsible for exploring new areas and opportunities for the expanding Amphenol portfolio product lines including ATEX antennas, DAS (Distributed Antenna Systems) and Cable and Connectors business. Our team recently attended an Amphenol Group training event and learnt about many forthcoming products as well as many customer applications for our range. As the UK distributor for the Amphenol Product range which include Procom, Skymasts and Jaybeam, we have extensive access to an amazing portfolio of combiners, duplexers, antennas, DAS product whether you are using either Hytera, Motorola, Icom, Kenwood or any other manufacturer’s brands across analogue, digital, TETRA or cellular product ranges. antennaPro is pleased to introduce a new range of cable products for business and industrial communication systems. The new cable products are manufactured by Amphenol Private Networks, a leading global developer, manufacturer with decades of innovation and experience. If you are looking to combine or split both 0 - 80 MHz and 88 - 960 MHz frequencies on your radio systems then the PRO-DIPX 80/88 may be the diplexer you are looking for. Featuring a Chebychev filter design, this new PROCOM diplexer ensures very high isolation across the entire pass ranges along with very low insertion loss. A new 0 dBd gain, omnidirectional base station antenna covering the 174-240 MHz band is now available. The CXL 174-240C, is a high performance broad-banded antenna and provides resistance to corrosion making it ideal for a wide range of applications. 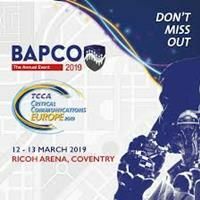 antennaPRO will be showcasing its selection of specialist communication products for the public sector at this year’s BAPCO Annual Exhibition and Conference, taking place between 21st and 22nd March at the International Centre, Telford. 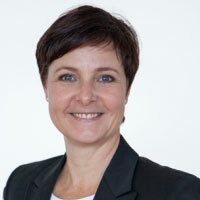 Mette Brink has joined Amphenol Private Networks (APN) as its new Managing Director. Mette will be responsible for the whole Amphenol Private Networks group, comprising the Procom, Skymasts and Jaybeam brands as well as the manufacturing plants in Wellingborough, UK and Frederikssund, Denmark. Designed for use in potentially explosive areas, the MA 160-Ex is a 0 dBd, vertically polarized, omnidirectional marine and base station antenna specified for use in gas groups IIA, IIB and IIC in zone 2. 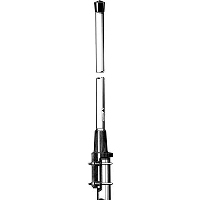 The ATEX antenna has a black-chromed stainless steel whip and covers the 154 - 161 MHz band. 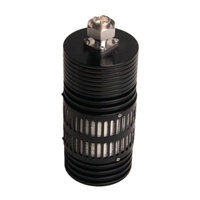 The PRL 100W-LP-7/16(m) is a new high Power (100W) low PIM load designed to cover 380 - 3000 MHz This coaxial load has a very low SWR and a very low PIM value and the surface of the load is black anodized. After nine successful years as Managing Director of Procom A/S, Peter Borregaard has decided to step down to focus on new personal projects. His replacement will join Procom on the 1st March 2017. 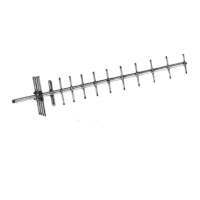 What to consider when sourcing an Antenna! There are a multitude of factors to consider when sourcing a commercial antenna. Firstly and most importantly is the frequency band. If the antenna is not working efficiently at the desired frequency then much of the transmitted signal will be reflected back from the antenna, rather than radiated from it. This reflected power, not only is wasted energy, but potentially can cause damage to the transmitter. Likewise, in the receive path, a poorly matched antenna will not pass signals efficiently to the receiver, thus degrading system performance. 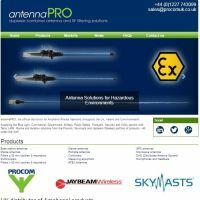 As well as carrying a comprehensive, market leading inventory of antennas, filters, combiners and DAS components, we also stock a range of accessories to support the equipment you purchase from us. 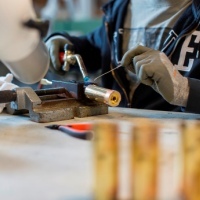 Accessories include mounting brackets, cables, connectors, grounding kits, measuring equipment etc and are all manufactured to the highest standards. Everything you ever wanted to know about Combining Systems, but were afraid to ask? 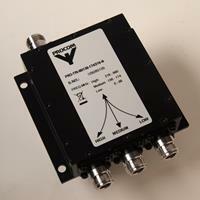 Simply put, a combining system places multiple transmit (Tx) and receive (Rx) signals onto a single common port. Within a combining system, a Tx combiner gathers all transmit signals together onto a single output port whilst a Receive Multicoupler will take incoming signals and split them to feed multiple receivers. 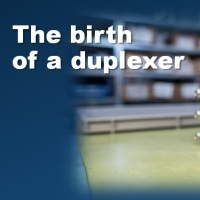 If the Tx output and Rx input are both fed into the Tx and Rx ports on a duplexer then the resulting common (Ant) port carries both signals to/from a single antenna creating a multi-channel RF combining system. Download the Latest PROCOM A/S Product Catalogues! 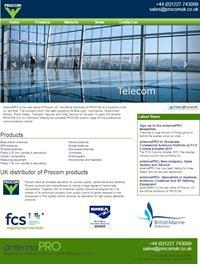 PROCOM product catalogues are now available to download. Each catalogue provides details of each product range together with specifications and where applicable optional accessories for each product. In a perfect world, RF filtering equipment would not exist as radio equipment would transmit/receive the desired signal perfectly. 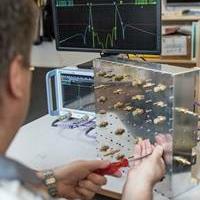 However this is far from a reality as radio equipment, generally built to high standards, has certain tolerances and limitations meaning that other out-of-band signals can be transmitted or received. If such signals are left unchecked, there is a good chance that someone somewhere could be affected (even on your own system), creating a loss of performance. It is the role of RF filters to help eliminate these unwanted signals and to provide optimum performance for your radio system. Who are the Amphenol Private Networks? 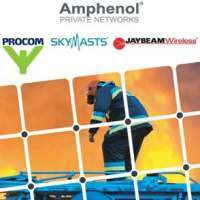 As distributors for Amphenol Private Networks in the UK and Ireland, antennaPRO are extremely proud to represent their brands; Procom, Skymasts and Jaybeam. As long standing customers of the Procom product range, you will already be used to the high quality and reliability, however, how much do you know about these other brands? A new catalogue illustrating the diverse, multiple solutions available from the Amphenol Group is now available. 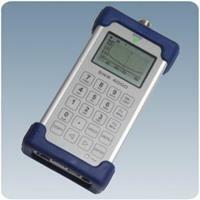 Procom have released a new catalogue dedicated to its Tetra combiner range. Our latest PDF newsletter is now ready to download. The set up and installation of the range of products that we supply can be quite technical requiring necessary knowledge and training. If you have any staff that has recently entered the industry or you yourself need a brush up on, it may be worth giving our team a call to arrange some tailored training for you are your sales team. You could arrange to visit our facilities or we could arrange to meet you. You may have noticed a brand new look to this website. 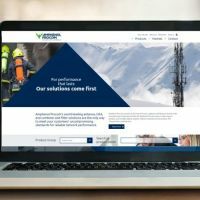 Our homepage has gone through a complete redesign to emphasise our status as the number one distributor of antenna, duplexer, combiner and filtering solutions in the UK and Southern Ireland. Solutions for the professional installer market from the combined Amphenol group will be on show at FCS Comms Installer 2016, the one-day industry summit and exhibition for all vehicle installation professionals. 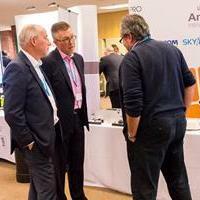 Representing the group will be UK distributor, antennaPRO, who will be showcasing the very best comms solutions from the PROCOM, Skymasts and Jaybeam product ranges. 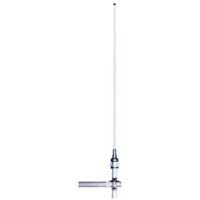 A new multi-purpose, omnidirectional, 0dBd, base station/marine antenna, the CXL 150-1LW-SS-R is now available from antennaPRO. The antenna provides high performance and is resistant to corrosion making it ideal for a wide range of maritime applications including onboard vessels or in coastal based offices such as in marinas or harbours. A new 19 inch rack mounting kit is now available allowing flexible integration of either the MPX 2/6 and MPX 70/6 duplex filters with a repeater (including the new Motorola SLR 5500). 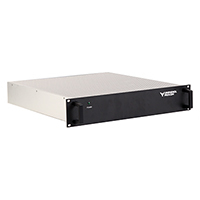 If you are looking to combine or split both 0 – 520 MHz and 790 – 2700 MHz frequencies on your radio systems then the PRO-DIPX 520/790-2700 may be the diplexer you are looking for. 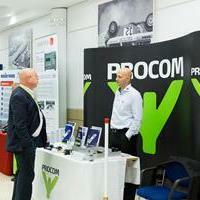 We are proud to have represented the PROCOM A/S brand for the last ten years. 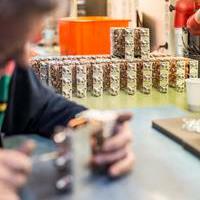 They develop and manufacture some really exceptional products, but how much do you really know about the Danish company? For over a decade, antennaPRO, formerly PROCOM UK has been supplying the business radio, telecom, industrial and maritime markets with the Procom range of antenna, duplexer, combiner and filtering solutions. 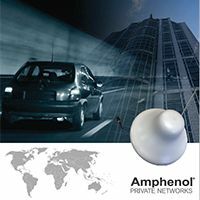 AntennaPRO together with representatives from Amphenol Private Networks will be holding a series of UK roadshow events throughout April. 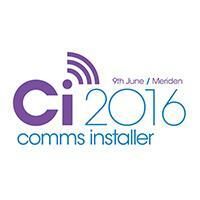 Each event will be informal and will cover the latest news from Procom, Skymast and Jaybeam Wireless. antennaPRO, formerly known as Procom UK, will be attending the 2016 BAPCO Show (22nd-23rd March 2016) for the first time in its new corporate identity. The company, now positioned as the UK’s leading specialists of antenna, duplexer, combiner and filtering solutions, will be showcasing a selection of its huge product range available from the Procom, Skymasts and Jaybeam portfolios. 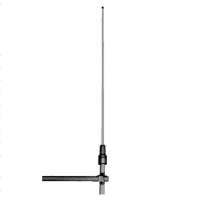 A new multi-purpose, base station/marine antenna called the CXL 2-1LW-CS-R is now available from antennaPRO. This new antenna is vibration-proof, lightweight, slim-line, corrosion-resistant and can be used either onboard vessels or in coastal based offices such as in marinas or harbours. Procom A/S have informed us that its range of microwave antennas including omnidirectional antennas, parabolic antennas and professional link antennas will be discontinued after July 1st 2016. 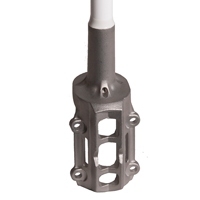 We are pleased to announce a brand new, light weight, stainless steel antenna mount from Procom. The new "LW-SS" mount is made from a high strength low carbon steel alloy and is especially suited to extreme marine environments due to it's superior resistance to corrosion. 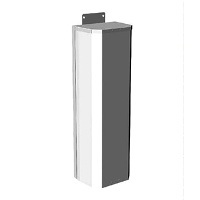 The 760 series of UHF Panel antenna has been designed to offer a very stable radiation pattern whilst giving a very wide bandwidth of operation. This approach enables the use of the antenna for multi carrier operation, and for use where site sharing is also a requirement. 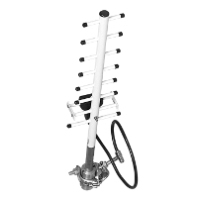 The antenna features carefully selected high quality components throughout including the main housing of the antenna being made from corrosion resistant marine grade aluminium. 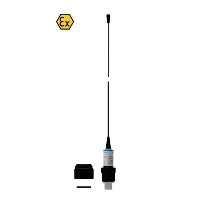 The CXL TETRA/LTE 800C is a dual-band 0 dBd, vertically polarized, omnidirectional base station antenna This antenna makes it possible to operate TETRA and LTE 800 transceivers alternately on the same antenna or simultaneously* on one antenna using a diplexer (*PRO-DIPX 520/790-2700-7/16 - must be ordered separately). 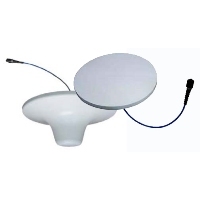 This CXL 70-3/GPS 4 active antenna series has been designed for professional users using both TETRA and GPS. Check out Procom’s Innovative XG-COMBI Mount Antenna! Have you seen Procom’s revolutionary GPS Combi mount antenna yet? The innovative mobile mount with “streamline” look can be installed virtually anywhere on the body of a car making it suitable for a variety of applications including VHF, UHF, TETRA and LTE 700. If you are an organisation that requires a stable antenna solution for long range SHF links, then the S.8YS SHF yagi is your answer. Offering a high gain directive pattern, the folded dipole incorporates a d.c. short to minimise static interference. The balun assembly is completely encapsulated in a closed cell foam, preventing moisture ingress. The all welded polyester coated construction lends itself to marine environments. 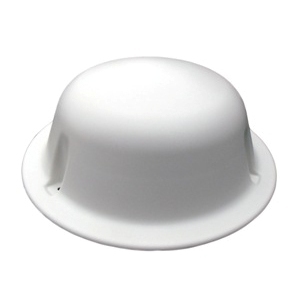 Considering some of the coverage/installation issues a radio engineer may face, the innovative 802.00.05.00 ceiling mount antenna can be conveniently installed with minimal disturbance. 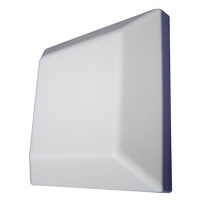 If you are looking to get good indoor or outdoor coverage for your TETRA or other UHF repeater systems, you should look no further than a new broadband panel antenna manufactured by Skymasts antennas. 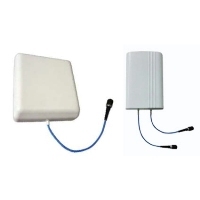 Named the 752.01.05.00, the dual-patch design gives the antenna stable radiation characteristics over a broad band of frequencies making it especially ideal for a large range of indoor multichannel UHF repeater networks. 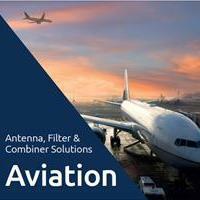 Further to our recent announcement, antennaPRO are now able to offer a full range of solutions from Amphenol Private Networks including Antennas, Cables, DAS Components, Duplexers, Filters, RF Combining Systems and other bespoke products from the Procom, Skymasts and Jaybeam Wireless family of products. Over the holiday period, antennaPRO will closed over the following days. antennaPRO will be attending FCS Business Radio 15 (BR15) with its latest range of antenna, duplexer, combiner and RF Filtering Solutions. The event held at Chateau Impney in Worcestershire on the Thursday 19th November will see a gathering together of the business radio industry to review regulatory changes and new industry and business developments. 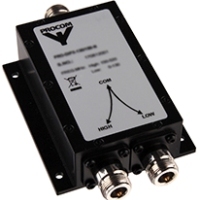 The Procom HPRS miniature receiver multicoupler has been specially designed to make your radio system more efficient. This new multicoupler can be used in a combining system making a single received line into two or four separate lines. Thus, it makes it possible to run several radio receivers simultaneously on the same antenna. 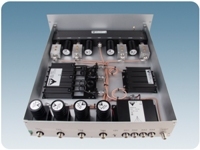 antennaPRO have introduced a new 50 Watt Triplexer to its product range. The PRO-TRI 88/136-174/216 makes it possible to use only one antenna* with the operation of three transceivers within the 0 - 88MHz, 136 - 174MHz and 216 - 960MHz frequency bands. 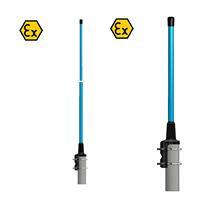 Danish antenna manufacturer Procom has added two new ATEX certified Omnidirectional Base Station Antennas to its ATEX range. Brought to you in the UK by specialist antenna distributor antennaPRO, both models provide an effective and efficient solution for base stations operating on either 146-175MHz or 2200 - 2700MHz. 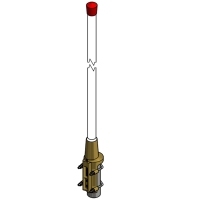 Designed for use in potentially explosive areas, the CXL 150-3LW-Ex (146-175MHz) and CXL 2400-3LW-Ex (2200 - 2700MHz) are 3dBd, vertically polarised, omnidirectional base station antenna specified for use in gas groups IIA, IIB and IIC in zone 2. There are four different versions of each to suit requirement. We are pleased to announce that Procom & Skymasts are now part of the Amphenol Corporation. This is part of the continued market growth and product expansion plans and will see some exciting new prospects for us and our customers on the horizon. antennaPRO is pleased to introduce the new range of PROCOM DAS (Distributed Antenna System) solutions. The range of products provides a positive way of improving indoor coverage by distributing radio signals in a precise and measured way to eliminate dead or poor coverage areas. Danish Manufacturer Procom A/S has an incredible array of TETRA products in its portfolio that provide communication solutions to many industries and organisations. 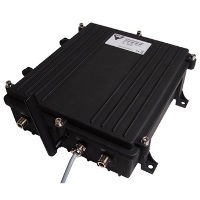 The CBBR-400 TETRA band selective repeater is its latest TETRA product, designed for 400 MHz TETRA systems in areas, which cannot be covered economically with base stations. 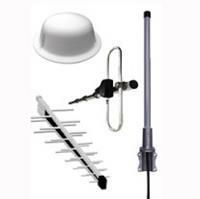 antennaPRO have recently launched several new combiner products for the TETRA market. Each of the products has being designed to be the smallest and most compact units on the market, suitable for both stationary and mobile use as well as being available in a tray for 19" rack mounting. 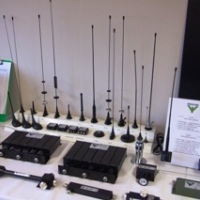 Following the acquisition of Skymast Antennas by Procom A/S, we would like to inform you that antennaPRO are able to supply the full range of Skymast antenna products and accessories along with Andrew cables and connectors. Follow antennaPRO On Google Plus! We now have a company page on Google Plus, providing another way for you to keep up to date with all the news from antennaPRO, the leading specialists in antenna, duplexer, combiner and RF Filtering Solutions in the UK. 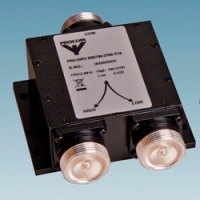 Specially designed for NAVTEX (Navigational Telex) receivers, an automated system used to transmit navigational alerts, weather warnings and urgent safety and rescue information, Procom’s new NTA 3E-SHT Short Active three-frequency antenna receives on the three NAVTEX frequencies 490 kHz, 518 kHz and 4209.5 kHz. 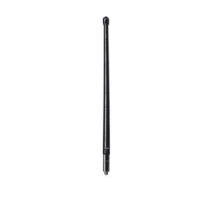 The 4220 Series colinear antenna is designed for demanding applications where a durable and high performance colinear antenna is required. The centre fed dipole design and feed network gives a stable radiation pattern across a wide bandwidth, and allows tilted beam designs to be effectively employed without large pattern distortions. antennaPRO have launched a company page on LinkedIn, the business-oriented social networking site. AntennaPRO is pleased to announce details of a new range of antennas designed, tested and approved in compliance with European 94/9EC ATEX directive. The new range will be certified to ATEX level ATEX CLASS: II 3G Ex nA IIA IIC T6 for use in potentially explosive atmospheres. 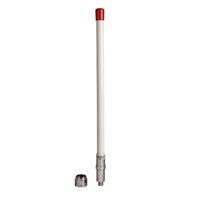 AntennaPRO are pleased to introduce the new MA160 End-fed ½ λ dipole marine VHF and base station antenna. Inheriting the PROCOM quality build and construction, this new base station and maritime VHF antenna has been developed for use on board ships as well as on masts. antennaPRO, distributor of PROCOM duplexer, combiner, antenna and RF filtering solutions are proud to announce the launch of a new website, one of the first fully responsive desktop, tablet and mobile websites in the two way radio industry. 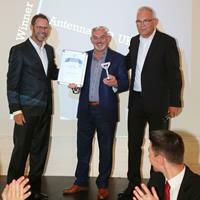 Bob Stockley, Managing Director of antennaPRO recently collected a PROCOM Partner Award for ‘Best Sales of Compact Combiners’ at the recent PROCOM Executive partner event in Copenhagen, Denmark on 3rd - 4th June 2015. There are a huge amount of things going on behind the scenes since our change in corporate identity. There are lots of innovative products coming to market as well as a great new website and newsletter which we will be launching very soon. The FCS Comms Installer 2015, the one-day industry summit and exhibition for all vehicle installation professionals marks the debut of antennaPRO, the official distributor of PROCOM A/S products in the UK and Eire. The event which takes place on Thursday 4th June 2015 will see Matt Luckhurst (Sales Executive) and Tony Barnett (Service Technician) exhibit the company’s extensive range of solutions for the professional installer market. antennaPRO, New company, Same Quality and Service! antennaPRO has now been trading for three weeks and we are very appreciative of your understanding and support about the change in our corporate identity. antennaPRO is the new name of Procom UK, the official distributor of PROCOM A/S products in the UK and Eire. The change in identity is an affirmation of the company’s strong business growth and independence that will allow the company to source and develop solutions for it growing customer base across all industry sectors. 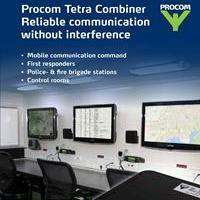 Procom have recently added two new products to its wide range of TETRA Combining products. 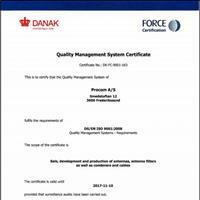 We are pleased to announce that Procom is now ISO 9001:2008 certified for its quality management system. The achievement demonstrates Procom’s commitment to providing the highest quality products and services. The certification is also a significant milestone in our continual efforts to improve and reflect its on-going investment in technology, development and process management. Procom add two new broadband base station antennas to its portfolio of antenna products. 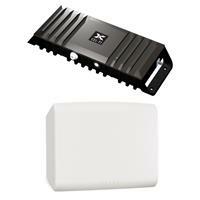 Procom announce a new Ultra Wideband Omindirectional low profile DAS indoor antenna. The new UWB-I 380-6000 is capable of supporting TETRA, GSM, PCS, LDMA, UMTS, WiFi 2.4 and 5.6GHz, 4G LTE and WiMax. 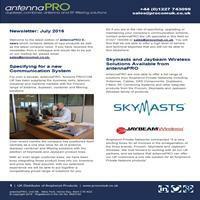 Procom A/S has acquired the UK antenna manufacturer Skymasts Antennas Ltd, based in Northampton. Procom have recently added a new mount to its portfolio of Mobile Antenna products. Procom introduces the XG-GPS mount offering a GPS antenna with external antenna for a wide variety of applications including VHF, UHF, TETRA and LTE. Procom have recently introduced some new Distributed Antenna Systems (DAS) components to their wide portfolio of RF products. 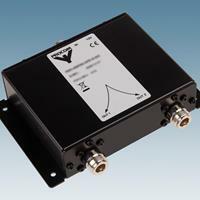 Procom Launch Covert Body Antenna for the TETRA-Band. Procom introduces the latest addition to its range of Tetra products the DDEFD 70/390MHz a flexible covert body antenna consisting of two separate ½ W antennas for optimal performance. Procom have recently added two new 4-Channel 19” 3 HU Single tray combiner systems to its wide range of Combining products. 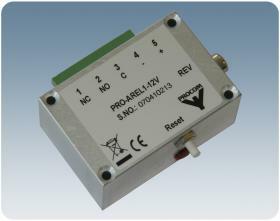 Procom Introduce the PRO-AREL1-12V Alarm Box. 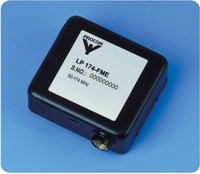 The PRO-AREL1-12V Alarm box is used for detecting high SWR in antenna systems. 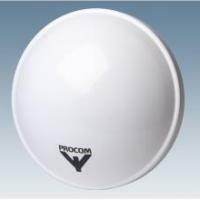 Procom Add New Base Antennas To Portfolio. 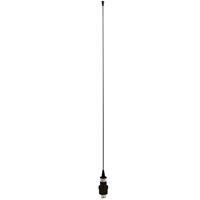 Procom add two new downtilt antennas to its portfolio of antenna products along with a new Tetra Base Station Antenna. Procom are pleased to announce the launch of a new series of high-performance 100W Diplexers covering VHF, TETRA and UHF frequency bands. 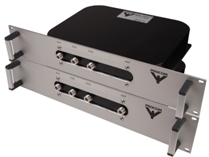 New from Procom UK are two low-profile fixed antennas for the 2.4 GHz and 5.5 GHz bands. From Procom UK comes a compact, all-in-one handheld SWR analyser with daylight-viewable graphical display, built-in signal generator and a data storage system. 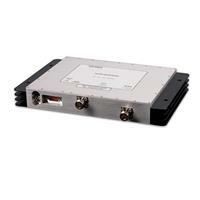 The SWR 4000 provides wideband coverage from 30 to 2700 MHz.